Join the discussion on our forums! Come discuss Mirage Caller over in our dedicated Mirage Caller discussion topic. played potion of madness and mirage caller'd it, sacrificed the potion minion. at the end of the turn my 1/1 mirage copy went to the opponents side lol. If you use its battlecry on a silenced minion, the summoned copy of it will also be silenced. Learned this today while trying to get a working copy of Archmage Antonidas. This guy has a sneaky love to toasts. Half of Herald Volazj's cost, half of the body, and one third of the maximum effect. Definite two-of in almost any Awaken the Makers deck. I love this card the effect and the art is amazing. Plus it gives me more reason to not craft Herald Volajz. Brother of the Tol'vir Warden ? This is what would happen if bruce wayne fucked t'challa. A baby Herald Volazja? Awesome! I really loved Herald Volzj, but this looks way better. Turn 9 Cairne isninsane! And N'zoth will give you 2 of them! I want arts like this,arts shouldnt be childish. 40 damage, 10 mana if you hit all four cards with the Thaurissan. 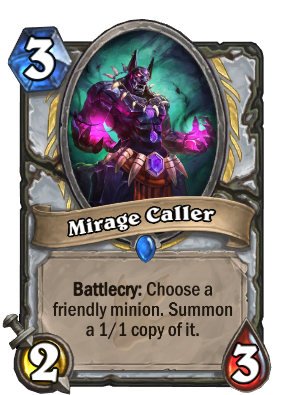 Or, you know, if you played your other Mirage Caller on the Thaurissan to cheapen your hand twice. I say with utmost confidence that this card is only allowed to exist because Emperor Thaurissan is rotating out. And Ragnaros. And Sylvanas. Oh boy, is wild going to be wild. do not tell me that you have rotated Sylvanas for this!